The completed pseudo swaddling band. Remember that strip of lace I bought when antiquing last month? I used it to make a "swaddling band," that 18th century strip of fabric used to bundle infants. 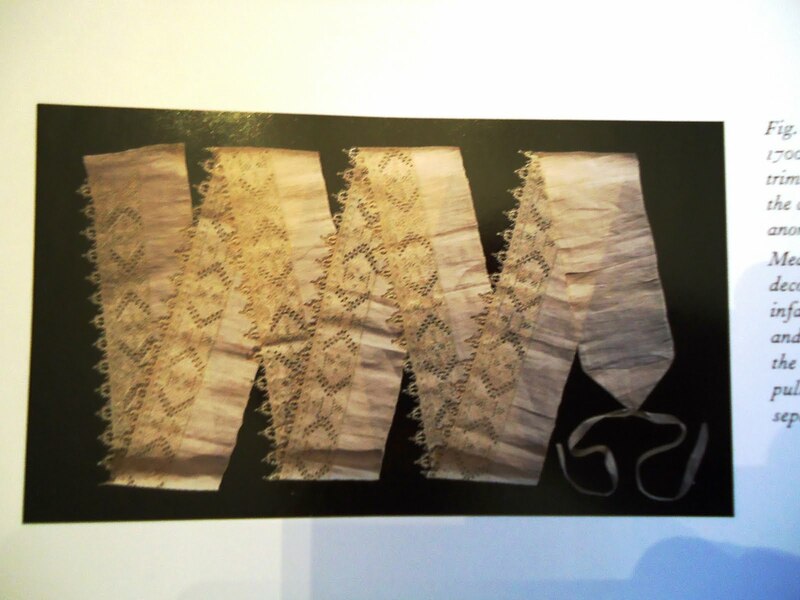 I modeled mine after this example from Colonial Williamsburg's collections, found on page 158 of What Clothes Reveal: The Language of Clothing in Colonial and Federal America. (Unfortunately it's not yet listed in their eMuseum.) 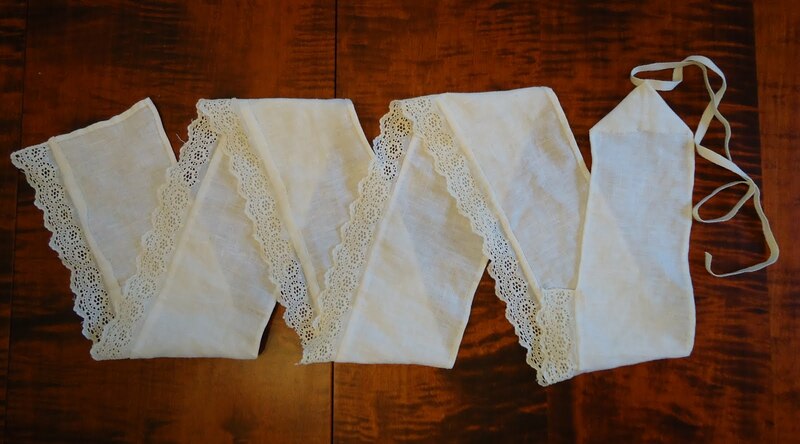 Measuring 144 inches long, it's made from linen and decorated with cutwork, pulled threads, embroidered with satin stitches, and trimmed with needlepoint lace. Attaching the lace to the linen. My piece of lace measures about 45 inches long, so I didn't have near enough to make it the same length as the original--nor is it needlepoint lace. 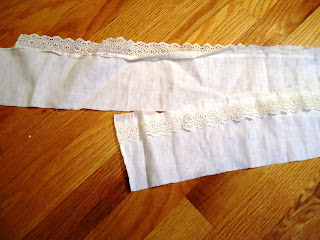 I cut a strip of linen and approximated the measurements of the end and the point (I added about 5 inches of linen). I flat felled the lace to the linen and hemmed the linen's sides. I then made a point at the end and attached cotton tape. 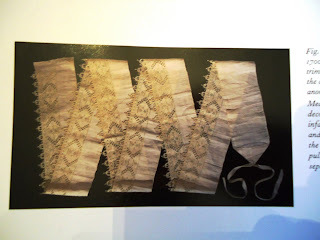 It's not a real reproduction - the lace looks too 1940s to be appropriate for the 18th century and it's too short, which is why I refer to it as my "pseudo swaddling band". Even though this project isn't 18th century accurate, it was a good opportunity to learn more about swaddling in the 18th century. My research found this example from the Victoria & Albert's collections (accession number B.13-2001). The description states, "Swaddling band made up of two thicknesses of white linen, seamed together at the sides with overcast stitching in white thread. The band is hand embroidered with an elaborate repeating pattern of stylized flowers and foliage, worked in white thread and using a variety of stitches including stem stitch, interlacing stitch, bullion knots, eyelet stitch and wave stitch filling. 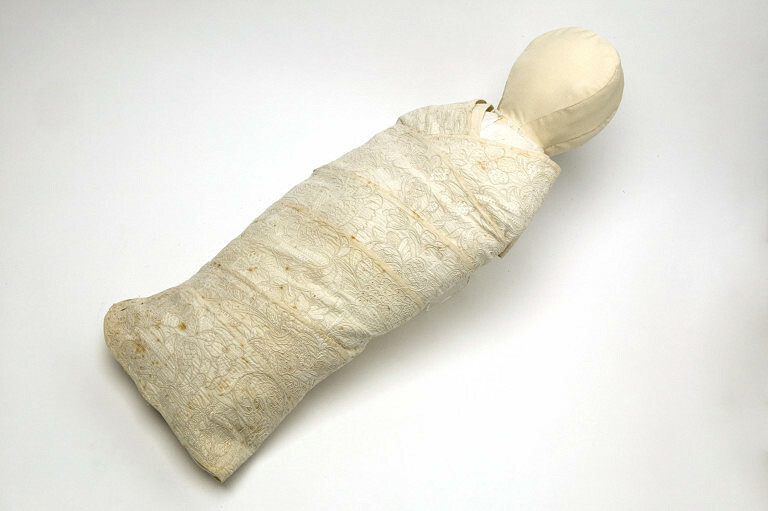 The embroidery indicates that this is an outer swaddling band, for use as the top layer; one end is straight and the other rounded, the latter being likely to be the outer end." "How has my heart ached many and many a time when I have seen poor babies rolled and swathed, ten or a dozen times round; then blanket upon blanket, mantle upon that; its little neck pinned down to one posture; its head more than it frequently needs, triple-crowned like a young pope, with covering upon covering; its legs and arms as if to prevent that kindly stretching which we rather ought to promote . . . the former bundled up, the latter pinned down; and how the poor thing lies on the nurses lap, a miserable little pinioned captive" (p.103). Cunnington and Buck also site a 1785 source where a doctor writes in Lady's Magazine, "The barbarous custom of swathing children like living mummies, is now almost universally laid aside" (p.104). Given these descriptions you would think that no one today would swaddle babies. But that's not the case. This week marks my little one's first birthday. I can vouch that perfecting swaddling with a blanket was a Godsend last fall when she was a newborn and during the early infant weeks. Being wrapped snug as a bug helped her feel secure and comfy, and stop crying. We followed the swaddling advice from Dr. Harvey Karp in the DVD Happiest Baby on the Block, which isn't nearly as restrictive as early 18th century swaddling. 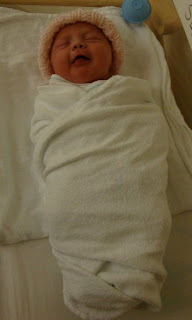 So would you swaddle your baby? If it make my little boy feeling comfy and secure surely I will try it.There is no reason to not try it. My sister used to swaddle my nephew. He loved it.